When creating a bunch of link worthy content giants, it is necessary to focus on the role of impactful link building. You may have tried many things, but if the results are not according to your expectations, then you have to try something new and more powerful. Most of the time link building strategy fails because you do not feed what most people need. In reality, most of the incoming links a website get only because it feeds to the ego of other webmasters. The most important link building strategy works around human psychology than feeding the search engine with SEO. Ego baiting plays a vital role in building links to your site. Ego bait content is a psychological way to attract high-quality one-way links and improve the quality of ranking signals. It is the time to uncover the link bait content strategy that will help you to build quality links and grab the attention of influencers easily. This strategy also works to boost the social engagement of your content. What is Ego Bait Content? Ego bait content follows one simple rule, and that is “boosting the ego” of webmasters and influencers to grab linkback from them. Most of the link building strategies follow creative content approach, but ego bait follows the personal and more targeted approach. Ego baiting content is about creating the content around a specific product, website, business, group or person. How does Ego Bait Content Strategy Works? Ego bait content is the perfect example of how marketing strategies and human psychology can bring excellent results. Every human in this world want to be famous and want people to follow him. Recognition for skills, accomplishments, and products always work as the most significant achievement of human life. It brings satisfaction. When you create content to boost the ego of a webmaster, or his products or services then you can easily influence them to share your content with their audience and even get the link back from their websites. “You are Awesome, Here are Why?” style posts. When building links using ego bait content, you should have a clear goal that what you want to achieve such as leads, backlinks, etc. When creating Ego bait content, you should focus on the influencer, product or service not just for the sake of link building. You may think that I am talking some old school thing here, but there is more in that. One can easily find out that the content you are creating is to help or promote the influencer or just for building links. Successful ego bait content always intentional, personal and focused. To choose the right type of ego bait content, you should decide your target. Let’s dig deep into the types of ego bait content to find out more about your ego bait strategy. A featured Interview is one of the most influential types of ego bait content. By featuring expert interviews on your blog or website you make them share your content again and again on social networks. The social signals, traffic, followers and even bring the link back to your site. Many sites have featured my interviews, and I share such posts again and again on my social networks to boost their social signals. This is an easy way for me to show gratitude and also increase their social signals. When interviewing an influencer on your blog, you can highlight their forte, ask them questions and share the whole story with your readers. This way you can try to build a strong relationship with influencers and encourage them to comment on your blog and share your blog posts. This is the beginning of a mutually beneficial relationship. Influencers love to share their interviews on social networks and sometimes you can even earn a link back. Featured interviews are easy to arrange and publish. You need to connect with the brand owner, webmaster or influencer to share the opportunity with them. If they are ready for the interview, then send them questions. Once you receive the answer, publish and share the link with an influencer and ask them to share it on social networks. The beauty of the ego bait interview content is that you need not spend hours or days to do research or spend long hours writing content. This type of ego bait will create unique quality content and boost social shares, traffic and backlinks also. Roundup post is one of the widely used types of link bait content. It is similar to an interview, but in the round-up post you will be featuring more than one expert or influencers in one post. It gives the influencers opportunity to get themselves counted among the list of other influencers. All the participants share the content, and this type of content also receive a lot of shares and traffic. The beauty of expert roundup is that you need not to create separate posts to feature different influencers. To create an impressive expert roundup, you need a topic which is according to the interest of your audience. For example; if you are running a health blog, then you can call health enthusiast, brand in the health industry and expert advisors to participate in your expert roundup. Now you have an idea. The next thing is to arrange the expert roundup invitation to invite participants and allow them to share their expert advice. After publishing the post, the next thing you should do is to reach out to all the participants and boost their ego to share the posts and get a link back. A listicle is a list article. You can find most of the listicles articles starting with “Best of” or “top 10” of a specific topic. This is also a type of ego bait content where you create a massive list of valuable influencers, resources, and products which can be helpful for your readers. Listicles are highly beneficial and informative for visitors. The best example of ego bait listicle article is where you include multiple products, businesses or influencers in one article to boost their egos. This is an easy way to engage them with your content. Make your content irresistible to make others feel honored. Choose a topic which not only attracts backlinks but also complements to your niche. Outreach to webmasters and encourage them to share your listicle content on their social profiles. Establishing a directory can be a creative type of ego bait content. Directories are helpful for users to feature their business. One can also use popular directories for lead generation. When creating a directory, you should focus on featuring those who are beneficial and related to your business. You can earn referral commission also to feature them on your site. You can also create a resource page of businesses that help you to grow your business. Awards are the most lucrative type of link bait content. There are already many organizations in your niche that are organizing award shows to recognize the leaders and influencers in your industry. To boost the effectiveness of your link building strategy you need to do a lot of research and invest time in outreach influencers. Awards always talk about the experience, expertise, and effectiveness of the influencers in your industry. You can start on a small scale. Start an award by featuring a post on your site. Make sure that when running an award strategy you should not lose control over values and benefits. Remember: Do not use the award for the sake of link building, but use them to build strong relationships with brands and experts. With the right strategy, awards can be the ultimate linkbait weapon to drive an immense amount of traffic to your blog or website. This will also help you earn some links. How to use Ego Bait strategy to generate leads and attract links? 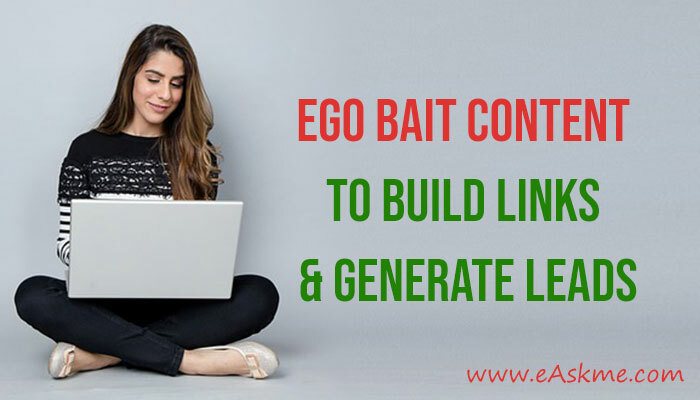 Once you understand the different types of ego bait content, it will be better for you to find out which link bait strategy work best for you. This will also help to target a specific set of influencers. Now you may want to start writing. First, create a list of contacts you want to ego boost or bait. Work on a strategy on how you will generate backlinks, leads, and shares. You must create a list to target niche specific, high-quality sites for link building. 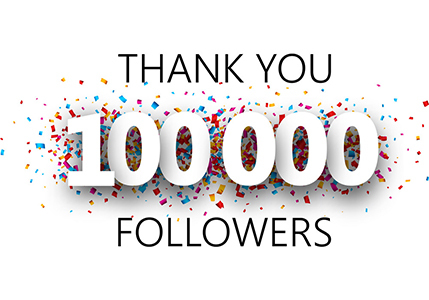 It is not a good practice to reach out to webmasters and influencers who have not interest in participation or generating zero value. You must choose the sites with strong SEO ranking signals such as ranking, authority, niche, etc. Also, make sure that they have the influence on the audience and have a creative social media presence. You can use favorite SEO tools, such as SEMRush and Ahrefs to find sites good for ego bait content. You can also look for the keywords they rank for, how relevant the site is? How much authority site have? And how much traffic they are getting? Create a list of reliable websites and start reaching out. Next thing you need is to choose the topic of your content and the type of ego bait content you are going to use. No matter you are writing the first blog post or writing the 100th blog post when creating content with link bait strategy you need to focus on popular websites. This will help you find out the type of content bait strategy you will be using. For example; if the list is full of influencers then you may consider creating a roundup post or expert interview series. If massive numbers of sites are from the business side, then you may want to create a directory or listicle. When choosing a topic for creating link bait posts, focus on your niche. Make sure that the topics you choose make sense to your visitors and your target. The topic you choose should be according to what the visitors are expecting from your blog or website. This will help to boost the engagement, get link backs and boost social share. You can also use your keyword research skills to find the topic to target organic traffic. Once you are ready with the topic, the next thing is to start reaching out to the influencers and experts. Once you are ready with the topic, the next step is to reach out to the webmasters or influencers to find out if they are interested or not. This is a great way to get a link back from them. To publish an interview, first, contact the influencer to make sure that he is interested. If he/she is interested only then send the questions and get replies. To create listicles, directories and roundup-posts you need to collect more information from your participants. You can reach out to them to receive the expert tips about your topic, their photo, contact information, etc. Share the brief intro about the topic and find out when you can complete the post. Appreciate them for giving their precious time for your post. Ego bait content is an influential part of the content marketing strategy. It does make sense when you put all the pieces of the puzzle together and create some of the impressive, valuable content. It is super easy to create an expert roundup post and an interview post. All you need is to collect the details and arrange them in the format according to your blog publishing style. You should include high-quality images, summary, and introduction. To create a directory, awards or listicles, you need to put efforts and gather data on your own. It can take some time, but for better results, you should do the research. You can hire a professional content writer or content marketer complete this ego bait content for you. You can hire a freelancer. This is the final step of your content bait strategy. You need to follow up after publishing the content. You should ask for a social share or link back. Also, follow up with the brands which have joined your directory listing to find out if they can bring referral traffic. Ego bait content is an impactful strategy to build strong social connections and create a network of professionals. Even if you do not get a link back, still you will get social shares, traffic and sometimes mentions. You can also ask for the collaborations or partnerships. Ego bait content is not just there to boost the ego of businesses or brand, but it serves the more significant purpose. It is the perfect tool to build a mutually beneficial relationship and target a specific market or community. When creating ego bait content focus on the participants and their expertise. Showcase their skills, and achievements with the help of narrative writing. Ego bait content not only suits your audience but it also boosts the level of engagements by including influencers in your content.